This is how our garden looked a couple weeks ago. 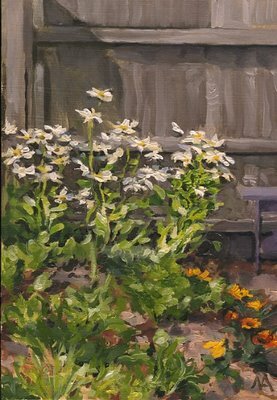 I had difficulty finishing this painting due to extremely humid and hot weather, which totally drained me of energy and put me in a stupor. We purchased a little inflatable wading pool and sat in it periodically over the course of the worst days. The garden has changed dramatically. The daisies are gone, the fence is being covered by morning glory vines, much of the salad mix in the foreground has bolted or been eaten, and the gazanias (the orange-yellow flowers in the right foreground) have grown and spread. Now I'm just hoping for a stretch of milder and more consistent weather so I can knock these paintings out faster. Also during this last month I've been working on a couple larger landscapes and more views of our garden. They will be posted soon.